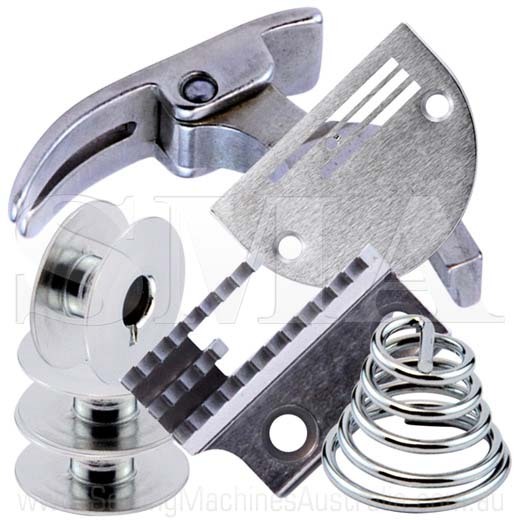 Heavy duty upgrade kit which allows your machine to be converted to sew heavier work. View our latest video below demonstrating how to install this kit. Your Singer 591 Industrial Sewing Machine is normally a high speed clothing machine and like many other people they want to try and use it to sew heavier work like Canvas, Vinyl and other heavier materials. A Walking Foot Machine is usually required for heavier work, in saying this your machine can be upgraded to be able to sew heavier work and take heavier sewing threads. It is also our recommendation that you slow your machine down by changing the pulley to a smaller size as the faster you go the hotter the needle will get causing the thread to constantly break, miss stitching and broken needles. Remember if you change the Pulley to a smaller size you will have to change the belt to suit, Please use the below chart when changing the Pulley.